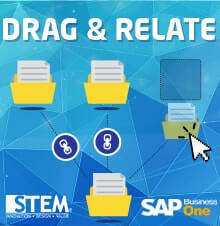 In SAP Business One, you can easily get information using “drag & relate” functionality. Next, click on BP Code in opened document window (in this example we use PO Document) until BP Code text box is highlighted, and drag to “Purchase Order” in “Drag & Relate” window. A new window (“Drag & Relate – Purchase Order”) will open with the list of PO Document for that vendor . This functionality can be use if you want to have another information, for example list of sales/po/grpo documents that consist an item.